I've been missing the Bible verse redirects from TS and I usually re-read one of them every day. 1 “At that time Michael, the great prince who protects your people, will arise. There will be a time of distress such as has not happened from the beginning of nations until then. But at that time your people—everyone whose name is found written in the book—will be delivered. 2 Multitudes who sleep in the dust of the earth will awake: some to everlasting life, others to shame and everlasting contempt. 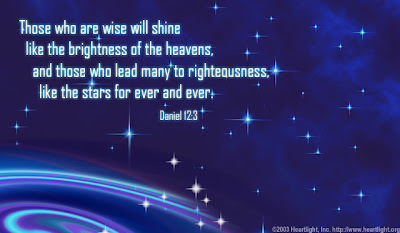 3 Those who are wise will shine like the brightness of the heavens, and those who lead many to righteousness, like the stars for ever and ever. Daniel was able to interpret visions and dreams for the king. Yet because of his loyalty to God, he was thrown into a den of hungry lions. We have all heard of him surely. His name was Daniel. Three of his friends were, for the same reason, cast into a white hot furnace. The God of Daniel and his friends rescued Daniel from the lions, and his friends from the fire. The attitude of Daniel and those like him was to let their captors do their worst. No matter what, Daniel and his brethren would obey the true God, and refuse to worship the false gods of their captors. In Daniel 12:1-3, Daniel himself tells us what supported his hope and courage, and what likewise can strengthen ours. Thank you SoldierofLOVE.......I miss them as well. I look at this like a huge learning curve for us all. It's good to always know what's important to your heart....it will remain. You are indeed a blessing........thank you! Be blessed friend! wishingstar wrote: Thank you SoldierofLOVE.......I miss them as well. I look at this like a huge learning curve for us all. It's good to always know what's important to your heart....it will remain. You are indeed a blessing........thank you! Be blessed friend! Aww......thank you SoliderofLOVE........you made my night! Thank you SoldierofLOVE... I too miss TS' Bible verse redirects. I should go back and find them all; print them all out or something. It's uplifting to re-read them and ponder over their message. I was a frequent reader of the Bible verse redirects of TS and I miss them too, thank you SoldierofLOVE.